Buying an SUV offers many benefits, which is why they are popular among consumers. At Mike Raisor Ford, we want you to choose a car that meets your needs. If you are considering an SUV, then here are some advantages that it offers. 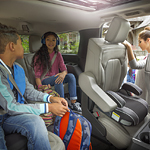 A Ford SUV provides you with a spacious cabin and plenty of cargo volume. Some SUVs available on the market have third-row seats that you can fold down for further cargo space. SUVs are also pet-friendly. The cargo bay lets you travel safely with your pets because it can accommodate pet carriers. With SUVs, you can also take advantage of enhanced capability. They have a higher ground clearance and available features that include hill descent control, traction management, and more. An SUV comes with underbody protection, such as skid plates, for a better off-road experience. SUVs offer more towing capability than smaller cars and can easily tow motorcycles, boats, campers, and more.